The drilling for sampling department at South32’s Cerro Matoso mine in Colombia identified an opportunity to improve its drilling process. The company introduced the Explorac 100 rig – and results have left the experts more than satisfied. At the Cerro Matoso mine in northern Colombia, temperatures can rise to 35 degrees Celsius. Rock slopes show shades ranging from greys to intense brown, which is evidence of the nickel content. Cerro Matoso, operated by global resources company South32, has been active for over 36 years and is one of the world’s largest ferronickel mines. There is also a production plant producing ferronickel through a metallurgical process and the product is exported mainly to Asia. When drilling for sampling, it is key to guarantee the safety of the operation, the quality of the samples, the productivity of the process and the cost of management. “For this reason, we control productivity by measuring the meters per hour drilled and the quality of the samples extracted with a rigorous QA/QC program,” says Drilling Supervisor Otoniel Vergara. The drilling process must be optimized to guarantee the required number of sampled areas in accordance with the mining plan. “The drilling performance for fiscal year 2017 prompted us to look for alternatives, including new drilling technologies,” Vergara says. The mine used to perform sampling drilling by the wet reverse circulation (RC) method, using a tricone bit system and water, at a rate of around 8 meters per hour in the pit area. This allowed South32 to obtain wet samples, but with a restriction on the capacity of realizable meters. After evaluating the alternatives, the company opted for Epiroc’s Explorac 100 drilling rig. 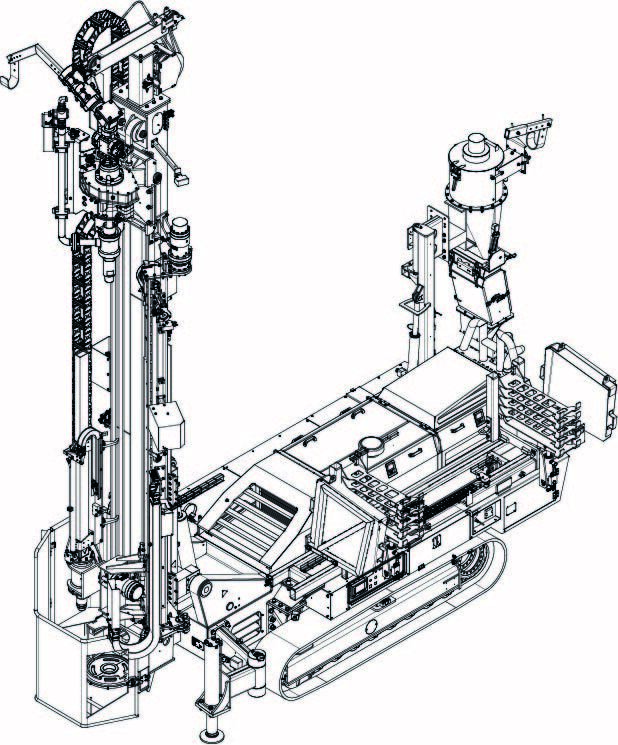 The rig’s RC method with a DTH (down the hole) hammer, performed with compressed air, was the best way to continue obtaining reliable samples and accomplish the required meters. Other advantages include inclined drilling, maintenance facilities, cost reduction, better operational safety and access to narrow areas. “With the Explorac 100 we are drilling 16 meters per hour, with production peaks of up to 20 meters per hour,” Vergara says. He also highlights the amount of sample recovered from the hole, with levels reaching up to 95 percent – in contrast to the previous levels of 86 percent. 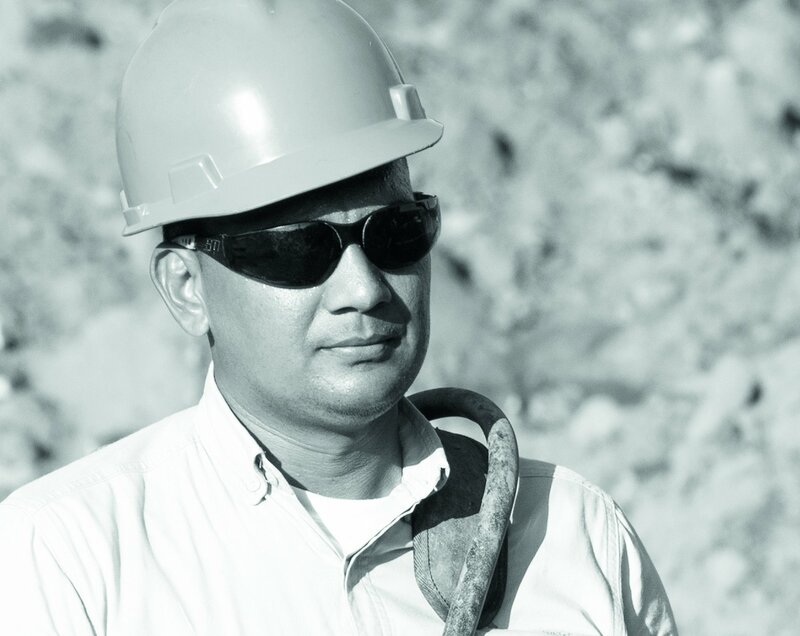 Nevertheless, for everyone at Cerro Matoso, the most important aspect is safety. 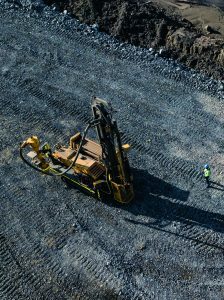 The remote control units and technology of the Explorac 100 allow the operators to control the machine from a distance and minimize physical interaction with drilling tools. 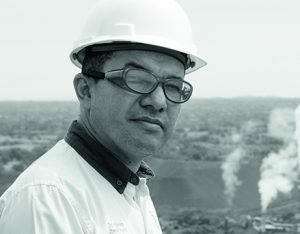 This is what Fernán de la Barrera, Explorac 100 Operator, values the most. “This rig is easier to operate. Using the same remote control, you can control all the functionalities. The rods are fitted through an automated arm that I guide from the control without the need to get closer to the pipes,” says de la Barrera. For the operator, the small size of the machine and the possibility of drilling on slopes provide a remarkable advantage. This is largely due to the characteristics of the terrain. On June 30, 2018, at the end of their fiscal year and with the support of the Explorac 100, Cerro Matoso achieved its drill plan for sampling. As a result, delivery of a second Explorac 100 is already on its way and Cerro Matoso hopes to transform its drilling fleet for sampling into more versatile and efficient rigs. “The Explorac 100 has been the great new discovery for South32 at Cerro Matoso. These machines, although small in appearance, are big on efficiency and that’s why they’re such an integral part of our daily work,” says Otoniel Vergara. 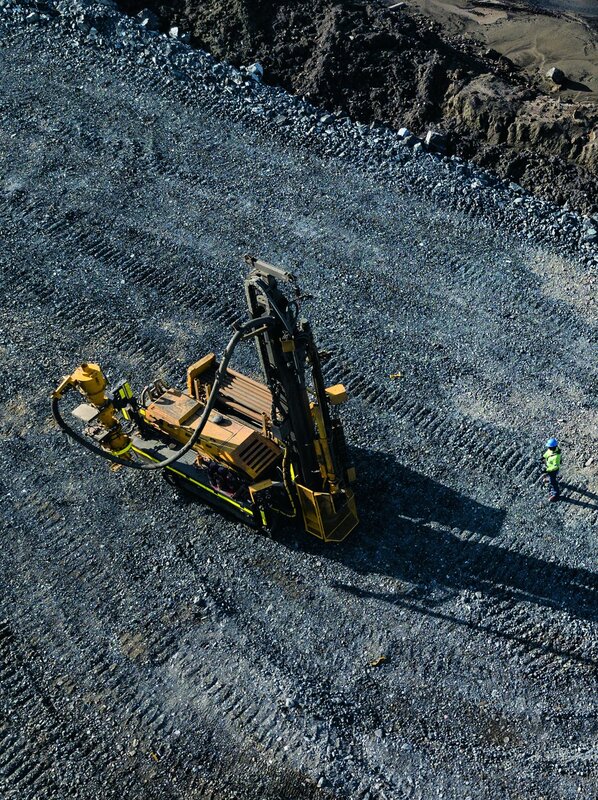 Reverse circulation (RC) drilling represents a fast and economical way to retrieve the high-quality mineral grade samples needed to efficiently plan mining and quarrying operations. Cuttings pass through a swivel and continue to the cyclone, together with excess compressed air. A representative sample is collected through the splitter box. Air (marked red) passes to the hammer between the inner and outer pipe. Cuttings (marked blue) are collected through the inner pipe. The drilling bit is powered by compressed air. Excess air pushes cuttings upwards through the inner pipe. 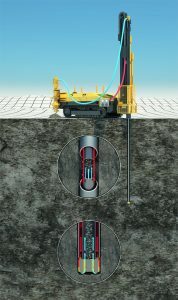 The Explorac 100 is a crawler-mounted compact rig specifically designed for reverse circulation drilling at depths down to 250 meters. It’s remote-controlled for extra safety. Rod handling system enables safe, hands-free loading, unloading and stacking of drill rods. Drilling anles from 45° to 90°. The two remote Control units offer precise Control of the rig at a distance of up to 40 meters, keeping both the operator and helper out of harm’s way. Riffle, cone or rotary splitters are available as options. The cyclone is fitted to a hydraulically foldable mounting post. South32 is a globally diversified mining and metals company, producing bauxite, alumina, aluminum, energy and metallurgical coal, manganese, nickel, silver, lead and zinc at the company’s operations in Australia, Southern Africa and South America. South32 is also the owner of a high-grade zinc, lead and silver development option in North America, and has several partnerships with junior explorers focused on base metals. 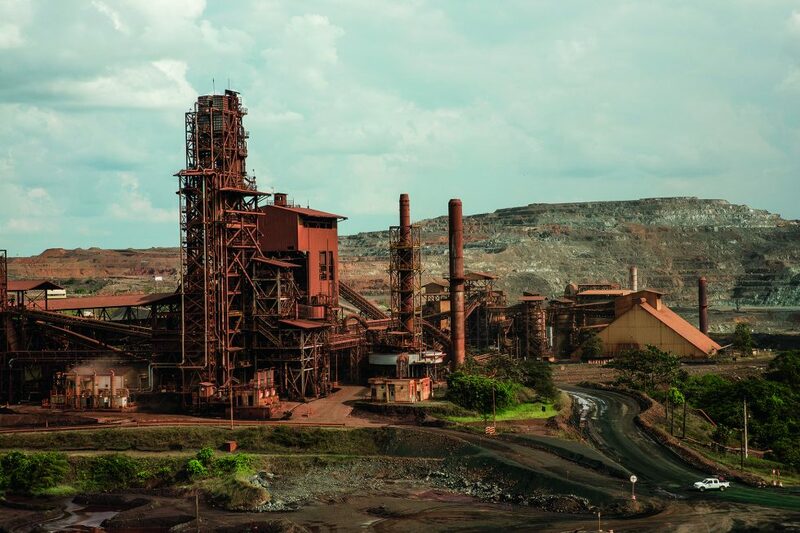 Cerro Matoso is dedicated to mining and transforming the nickel contained in ferronickel, using an energy-intensive pyrometallurgical process. For more than 36 years Cerro Matoso has been exploring, extracting, producing and selling the nickel contained in ferronickel for the production of stainless steel. Cerro Matoso produced 43 700 metric tons of nickel in fiscal year 2018. Drilling with the Explorac 100 has improved South32’s grade control drilling rate from 8 m/h to 16 m/h. The Explorac 100 facilitates inclined drilling with up to 45 degrees of inclination. Epiroc operated under the trademark “Atlas Copco” prior to January 1, 2018. © 2019 Epiroc Sweden AB. All rights reserved.